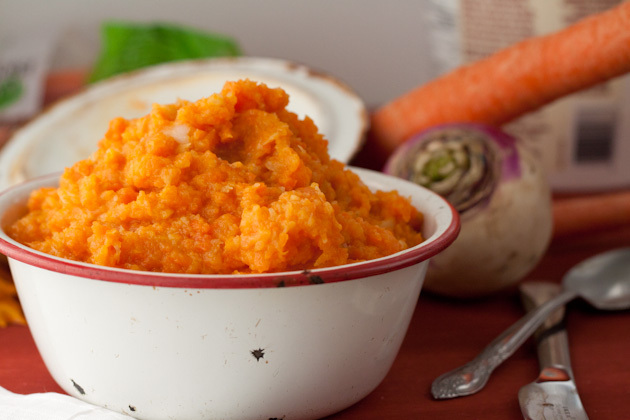 A lighter and sweeter mashed vegetable dish, perfect for Thanksgiving… or any ‘ol day. 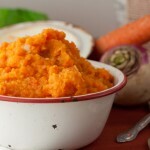 Place chopped turnips and carrots in a large saucepan. Fill with water and bring to a boil with the lid on. Boil for 20 minutes, or until vegetables pierced with a fork are soft. Drain, return back to saucepan and add maple syrup and coconut oil. Mash with potato masher or transfer to stand mixer. Mash until all large clumps are gone.